Dean Miller, National Sales Manager at VisitFairfax in McLean, Virginia, sets the stage for how to choose your next reunion location, questions that need answering and initial contacts to start planning your next reunion. Q? My family has a reunion every two years. This year it is in Colorado and we are looking for ideas for the next reunion. We are spread across the country and are looking for a central location. It is getting more difficult to plan a reunion since the number of family members is growing and it is hard for one person to organize everything. We are from Minnesota, Michigan, California, Colorado, Virginia and Arizona. Any ideas would be appreciated. Question # 1 – Where should we meet? Question # 2 – How does one person begin to organize the reunion? How easy (or difficult) will it be for people to get there? How expensive will it be? Can most folks drive there? If they have to fly, is there an airport nearby with ample flights and reasonable air fares? The less it costs to attend, the better your attendance will be. If folks are coming from both sides of the country (as is the case for this planner’s family), a central location such as Lake County, Illinois—in the Chicago area—may work well. St. Louis, Kansas City and Dallas are also good, for the same reason: no one has to fly all the way across the country to attend. 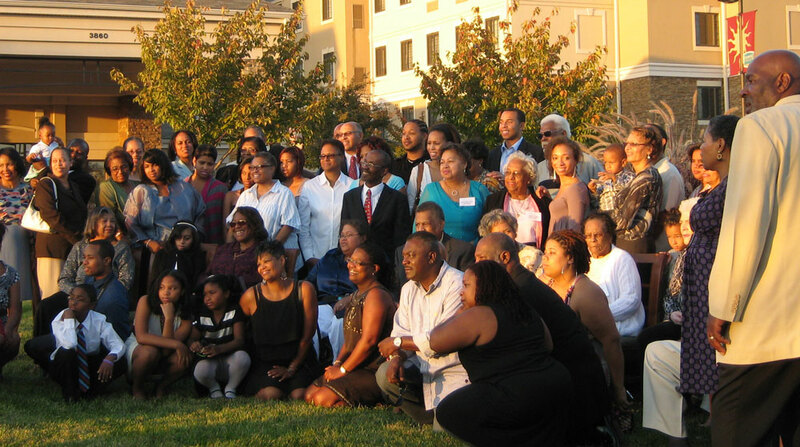 Epps Family Reunion in Fairfax County, Virginia. What types of things do you want to see and do? You can get together with your relatives in any hotel ballroom anywhere. Likewise, you can have a picnic most anywhere. You’ll want to select a location with interesting, memorable and fun activities, which is what makes the reunion special! Do most of your folks like the beach? (Some do, some don’t!) Do they want to ride roller coasters? Visit a museum or a historic site that has meaning for your family? Ride a steam train? Attend a concert or show? Go shopping or out to eat? Play golf? What ages are the majority of your attendees? Things that delight young children may bore teenagers and vice-versa. Riding the Tilt-A-Whirl at the amusement park may be great fun for the sixteen year-olds, but not for those over 40. If there are lots of young children, having ample things for them to do is a must; if they’re bored and restless, they’ll certainly let their parents know! How expensive are the local hotels? Staying at a four-star resort is a wonderful experience, but is this what your family members are looking for? What rates are they willing to pay? At many beach resorts, summer is peak season, and rates are high. You may want to look at getting together at a location in their off season; the hotel or local Convention and Visitors Bureau (CVB) can tell you when off season rates apply. You’ll stay in the same hotel, but at much more attractive rates! Meals are another big expense. Are there family-friendly restaurants in the area? Does the hotel offer refrigerators in guest rooms where folks can store simple staples (juice, milk, sodas, etc.)? Is breakfast included in the rates? All these things can help attendees control the cost of attending your reunion. How expensive are local attractions and sightseeing? If the only attraction around is a theme park and the tickets are $75 per person, that’s a $450 expense for a family with four children! (And that’s before they buy their first hot dog!) Consider places with state or local parks, museums, art galleries, historic sites and other activities that are either free or which can be enjoyed at minimal cost. Again, the key to choosing the right location is matching the location to your family in terms of travel distance and expense, the availability of activities your family can enjoy together, and the expected costs everyone is willing to pay for lodging, meals and activities. Now, how to narrow down a long list of possible locations to a select a few you can seriously consider? Many families vote where to hold an upcoming reunion. That’s easy. Call or email the CVB in each location you’re considering. The local CVB is your very best source of information about all the things you’ll need to consider when deciding where to meet: access, activities, lodging, restaurants, prices, best times to visit, and much more. And virtually every CVB in the country is eager to assist you free of charge! 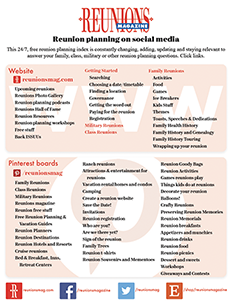 Reunions Magazine features a directory of cities/destinations in every issue that have demonstrated they are eager to host your reunion. Start with this list. Dean Miller is national sales director for Visit Fairfax. He can be reached at 703-752-9509 or dmiller@fxva.com.